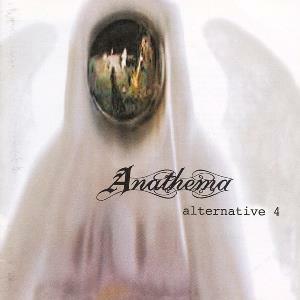 So here we have it, the fourth album by England's Anathema, an album best described as Pink Floyd influenced doom metal. That may sound like an interesting proposition but in fact its anything but. The doom metal part of Alternative 4 is the overriding main part of their sound, touched by a Wall era Pink Floyd style lead guitar. This actually sounds quite nice, and would make the music interesting if it wasn't for the fact that it was wholly predictable and sounded like a forced and clichéd attempt at introducing something different to the overall style and soundscape. The music ends up being slow and cumbersome, but its not the worst part of Alternative 4, that would be the vocals and lyrics of Vincent Cavanagh (well, the Cavanagh brothers and Patterson all wrote some songs, so they are all equally to blame in that department). Vincent's voice is dreary, monotonous and down right boring, bordering on sleep inducing and isn't helped by the over-the-top and frankly cringe worthy vocals, which typical of doom metal talk of death and betrayal. Avoid, go for the vastly superior Judgment.